Today's WP7 Review and the second review for Xbox Resource see's a change in style from yesterdays Fruit Ninja. Today we look towards OMG: Our Manic Game which is a vertical sci-fi shooter with a similar art style to that of Geometry Wars. So is this game worth the small entrance fee or should we all just move along to something else. Let us find out what's behind door number two. The game play in OMG is just about as simple as a game can get, you mission is to control a ship and destroy all of the enemies on the screen with just using only your finger as a weapon. Now that last sentence isn't entirely true because your ship emits a laser which can upgrades at certain parts of the games levels, this laser will automatically whittle down enemies health and kill them meaning if you want a really simple game then all you have to do is just avoid incoming fire and attack them with the laser whenever possible. To make things a little more interesting though the game allows you to touch the enemies which sends them into a mode called Manic which will slow down the enemies, but they will also throw more bullets your way for you to avoid, but with most enemies these attacks can be easily dodged or avoided seeing as they normally follow a set path, its only enemies later in the game that fire bullets/attacks at you which can auto aim onto you. The game isn't really spread into different levels either as the action normally keeps flowing as soon as you start the game up, the action will start off pretty slow to begin with within the first three stages but the more boss' that you defeat or rile if you touch them, then the faster the pace of the game gets, by the end of your first play through of each of the five stages the tempo of the game would of sped up by around seventy percent of what you first started out on. Now with the game being so fast its important to always keep your laser fully upgraded and to do this all you simply have to do is survive, if you somehow manage to run into an enemy or hit a stray bullet once you respawn your laser will begin again at level 1, which is complete suicide by the time your half way through the first run through. I keep mentioning that you do run throughs of the game now don't get confused and think that you can complete the five stages and the game ends, and then maybe you can start a new game at a slightly higher speed. No what I actually mean is that there are five stages with five bosses, once you have defeated a end stage boss you then move onto the next stage and you rinse and repeat, once you defeat the fifth boss you then start all the way back at stage 1 again but the difference this time is that you won't be facing slow enemies any more they will be just as fast as those that you just defeated on the fifth stage. Now that hopefully we got all of that cleared up the game features two different modes, one is called infinity which is what I have just been talking about, you keep playing until all of your five lives have run out, you play for the highest score you can get. The other mode is called quite simply 5 Minute mode, in this mode you face all the enemies from infinity mode but in just five minutes only. At the end of the five minutes if you didn't die then your game will end and your score will be totalled up. Everything in this games game play is quite positive, but there is one gripe that many people have with this game and it appears to be a glitch that still to this day remains without a patch, The glitch is of course the fact that you could be in the heat of battle and you may just be about to beat your all time score and maybe top the leaderboards and then o no you notice the game crashes and exits and leaves you in the game library on your phone. The reason for this glitch is still unsure and it can be highly infuriating, but most people think it's all down to how many enemies you Manic on screen at once, and maybe the game can't cope with all the processes. Unfortunately this can be a major deal breaker for some people, for me this only happens once every three or four games and normally at the start of a game but it still can be highly annoying. 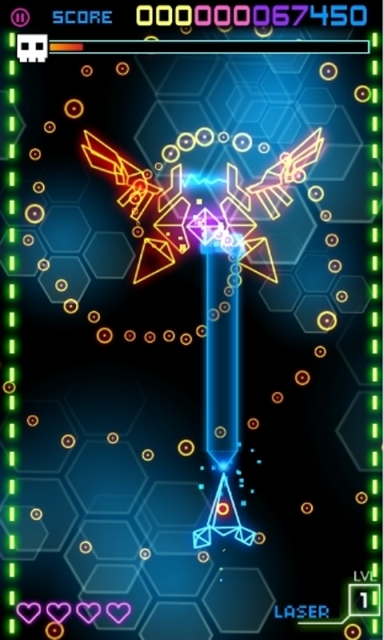 The graphics in this game are very much just like the gameplay, they are real simple but still they have that Tron and Geometry Wars style to them with the neon colours and wirer mess 3d designs. The graphics are all really colourful and the futuristic design really gives it a nice edge to finish off the overall look. There are many different enemy designs and I�m pretty sure I still probably haven�t seen them all as of yet and each enemy as I stated earlier have different attacks, so its nice to see on screen when an enemy throws a bubble attack at you or you see bubbles getting closer to you instead of just normal shots being fired at you. The blue neon auto-aiming cones are also nice to look at. The only downfall though that I have with the graphics is the background, sure it has moving images in the background but at the end of the day that�s all it really is just moving images, and because of that it can look really bland compared to everything else going on at the same time. Still though with the design choices that they chose for the backgrounds, they all seem to match up to the rest of the games look pretty nicely, would of just been nicer to see a little bit more variety or something a little more, maybe visualisations that resemble the newer space invaders games. The sound I feel is really where this game lacks but let me try to explain my reasoning behind this. Even though the game users upbeat trancey types of songs, it becomes clear very quickly that they seem to be on maybe a ten second loop, so if you really concentrate on the music whilst playing the game then this can tend to annoy you a little bit. The music does change things up a bit though when you go into a boss battle, but again after maybe thirty seconds or so they music will die down and repeat itself again until you either defeat the boss or hide it out in a corner and let him explode by himself. The sound effects for when you blow up or when you defeat an enemy or quite nice and fitting, as they again sound like something you may hear from Tron with a sound of something Derezzing from one of your laser hits, also when you Level up you tend to get a futuristic ding kind of noise, it�s a noise that you can�t really described if I�m honest, but it does its job well and it alerts you to know that you have levelled up. An area of the game though that I personally believe was a missed opportunity is when you�re your attacking an enemy, there is no noise to clarify that your actually hitting them, so no like derezzing or fizzling noise, this makes attacking enemies a bit dull, as it means the only sound you get is them exploding once they have died. This is an area I really did like in this game, newcomers will need to take a few goes at the game to get a hang for it and learn the different attack patterns but for people who are used to the game the added speed that comes with completing different stages really is a treat. It�s nice to get onto your second playthrough and have to think really fast about who to attack and avoid whilst trying to make an attempt at an escape ready for the next wave of enemies on the attack. Some people who play this game though may use the exploit of just sitting in one of the top corners of the screen as boss�s can�t hit you whilst you are perched in one of them, this is a shame as it makes running away just that little bit more easier then it should have been. But for the people out their that actually do take on boss fights then you will be shamed to know that once you learn where to sit to avoid all of the attacks then you will be fine, seeing as there is only one boss with auto-aiming rockets, the rest just follow a pattern which can be easily figured out. Granted all the boss�s move slightly when attacking but their attacks won�t move with them. All round though this is a fun game for the challenge it can give you later on in levels, and the game really does make use of the fact that if you want to survive you better bring a maxed out laser with you into the later rounds. The achievement list for this game in my opinion is a really strong list, full of some both easy and challenging achievements, some of those achievements will take time to master getting up to beating the high score set by the devs and also riling the bosses. Whilst others can come quite easily for just sitting still for 10 seconds as this can be done whilst hiding in one of the corners of the screen. One of the better achievements is for staying alive for 8 minutes but this will come easily to any of you out there that are good at the game and are able to survive the onslaught of enemies that will come at you. But unfortunately the bug that I mentioned in the game play section of the review, will show up to rear its ugly head many times whilst trying to attempt the secret achievement, for playing the game for three hours without turning it off. Seeing as you will get booted back to the game library after every few games this achievement can become a real pain to do, you better hope you can hang out in the corner of the screen without being hit, or hope for a glitch where no enemies spawn to help you get this more easily. Hopefully if this game ever gets patched then this achievement should be really easy to get. All around though the list is a good one and one of the better WP7 lists to come out. For the very cheap price of what the game actually is I really recommend you buy this game, there are far worse games out their for your WP7 for more money that aren�t as good as this, sure the game has its problems but what game doesn�t and hopefully with a future patch then the biggest problem of all that this game faces may actually get fixed. What makes you think that? 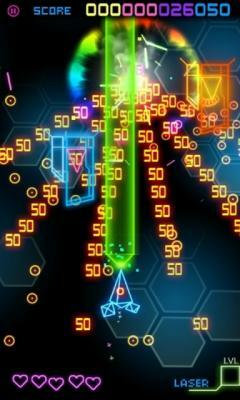 It is a really good and addictive game, but it's one flaw major flaw should of been patched by now. I managed to get the full 200g from this game shortly after i wrote the review, i would say grab it though. What makes you think that? It is a really good and addictive game, but it's one flaw major flaw should of been patched by now. I managed to get the full 200g from this game shortly after i wrote the review, i would say grab it though. you should include prices for the games your reviewing. you should include prices for the games your reviewing. nice review anyway.